Hi! 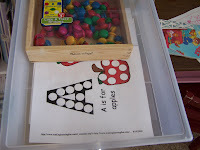 Here is our Letter A collection of activities! 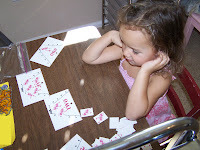 So far we love our Power Magnets! 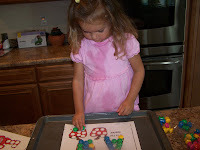 I downloaded fun worksheets from here, and then you just break out a cookie sheet and voila! 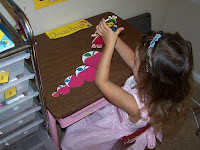 Magnet fun! 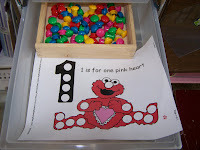 So of course they’re in her first box for tomorrow, we have the Letter A this week, so watch for more downloads! 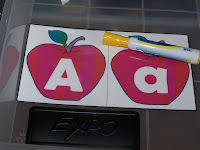 Capital A and Lowercase a matching game, I made cute little ants and then cut them in half for the matching peices. You can download it here. Its a color matching too, gotta love the 2 for 1’s! 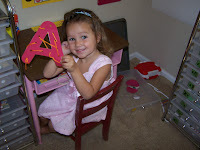 Letter Aa wipe off writing practice, downloaded from here, thanks Erin! 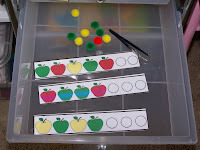 An apple pattern worksheets with pom-poms and tweezers, downloaded from here. 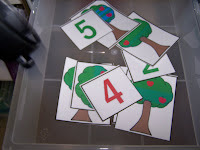 An apple counting game and number matching, downloaded from here. 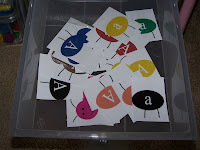 Letter A Lacing Cards, downloaded and colored from here. Here is our Anthill counting game, the goal being to put the correct amount of ants on the hill based on what the card says. You can download this one here! Of course we had Apples for snack!